Gov. Mike Dunleavy and members of his administration spoke at forum Tuesday night hosted by the Alaska chapter of Americans for Prosperity. The event series has drawn criticism because of AFP’s connection to conservative out-of-state funders. Speaking to a packed ballroom at a downtown Anchorage restaurant, Dunleavy made the case for his major reduction in the state budget. The proposal seeks to close a $1.6 billion gap by reducing money to K-12 education, the university system, the marine highway and other government services, while also paying out more than $3,000 in Permanent Fund Dividends. Dunleavy was joined by other members of his administration, who together spent more than an hour going through a presentation about how they built the proposed budget. Audience members submitted questions in writing, some of which were later asked of speakers by AFP State Director Ryan McKee. 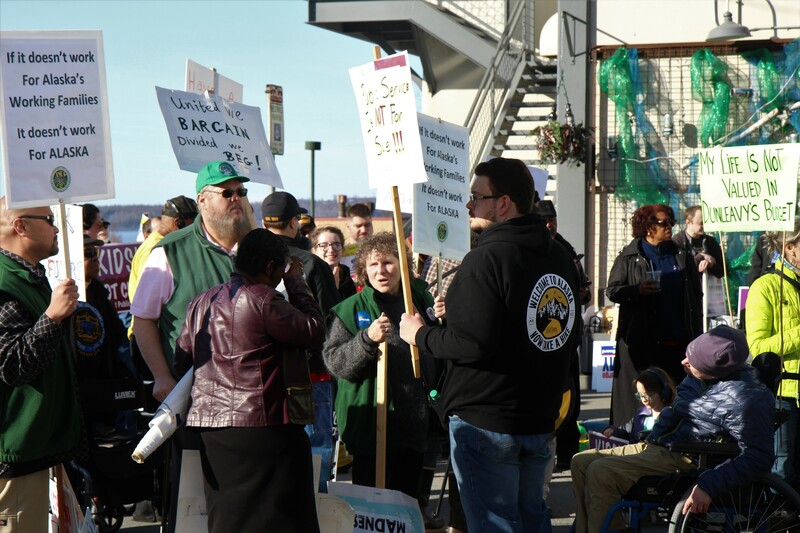 One of the themes was how the administration can justify such drastic cuts to services many Alaskans depend on. Dunleavy and others pointed to poor outcomes in education and the ferry system as evidence the status quo is not working. Budget Director Donna Arduin explained that policy improvements will follow budget changes. 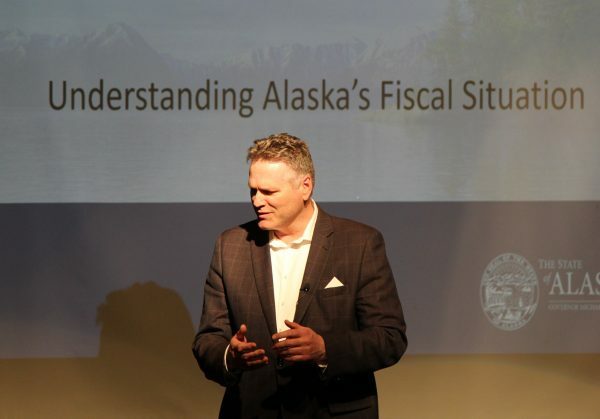 Beyond the budget, Dunleavy emphasized the need for three proposed constitutional amendments that he believes will give Alaska a permanent fiscal solution, including caps on government spending, solidifying PFD calculations, and requiring new statewide taxes to go before voters at the ballot. The audience inside was generally sympathetic to the governor’s message. Security guards by the entrances quickly quelled a few minor attempts to disrupt the presentation. Two women unfurled a banner that said “Recall Dunleavy,” and were promptly escorted out. Outside the venue, a crowd of more than 250 rallied against the forum. Many were critical of AFP’s role organizing the event and restricting attendance. AFP says the restrictions were based on space available at the venue. According to McKee, the group paid between $5,000 and $10,000 to cover the cost of forums in Anchorage, Kenai, Fairbanks, Nome, and Wasilla. The rally was organized by a group called Save Our State, a loose coalition of unions, non-profits and advocacy groups supporting a broad range of issues. Anchorage resident Thomas Pease was critical of AFP’s requirements to enter the town hall which included registering online. Speakers at the rally included local politicians and representatives from nonprofits like the NAACP, Great Alaska Schools and Native People’s Action, all of whom listed ways they believe the governor’s proposed cuts would harm Alaskans. Anchorage mayor Ethan Berkowitz gave the final speech, saying many programs that the governor wants to cut are older than the state itself. But not everyone at the rally opposed the governor’s proposal. Mike Alexander was one of a small group of people standing in solidarity with Dunleavy. Alexander is a retired nurse from Big Lake. He’s in favor of the governor’s plan to deliver larger PFDs. Alexander acknowledged that the governor’s plan to make all of his proposed cuts in one year is ambitious, and that it’s more likely to take a few years to bring costs down. As for AFP organizing the rally, Alexander sees it as a safety precaution.